OMG! Yes, this is real. He explained that we have 9 breaks a day and should be able to do at least 20 a break for 6 of the breaks. We can also count those done in the gym. We CANNOT count those done at home or with someone outside of class. They have to be done in view of our arranged partner. There is an "Alysha's Pushups and Situps Notebook" that only my partner can write in. 8000. I cannot even get that figure out of my head. Situps are expected to be around 12,000. An improvement from last year?? Yeah, they had 14, 500 pushups. I guess we are in better shape. And I guess I will be a rock when I leave here. In addition, we are, as a group, expected to improve by 20% in all areas we were tested in. Excuse me while I go cry myself into pushup position! ha. I really am quite concerned. If anyone out there wants to do them with me, we can keep a running cyber-count. I am probably going to need a little extra motivation. First Run in a Month! And it didn't feel all that bad. AND, when I turned on my iPod, I realized I forgot to charge it! DOH! 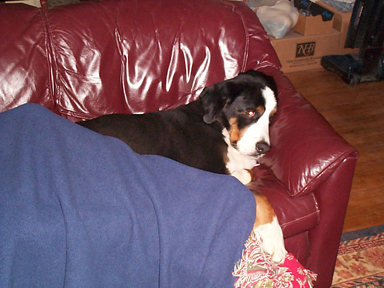 Despite the lack of tunes, the annoying 100 lb. bouncing gazelle on the treadmill next to me and the worst XM Satellite station of all 4 million stations...it felt pretty good! ...at the end of the tunnel. Some hours it's a faint glimmer, other hours it's bright and shining. Perspective is a wonderful thing. Let's just say that my meds seem to have moderated (translation = I no longer have fleeting thoughts of hurling myself in front of a bus) AND I have the most excellent, loving, supportive, loving, caring, (have I said loving?) friends and family on this planet. I've spent very little time alone this past week because my support system has rallied. It feels pretty incredible to know that I'm not alone. And that all I had to do was ask for some help. And now for the big news: I'VE GOT MY SWIM ON!!! 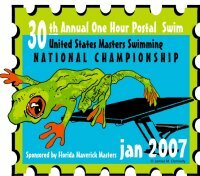 US Masters Swimming does a "Postal Event" every January - no you don't "go postal" (thank goodness for me) but you do swim for exactly 60 minutes and someone records for you how far you swam. AND, the cool thing is they have to write down your times every 50 yards so you have a great record of your splits over the whole hour. THEN you send them in (via the POSTAL SERVICE) to USMS and you get to see how you rate as an endurance swimmer against thousands of other swimmers in the country and in the world! Pretty cool eh? The only catch is that you have to be a USMS Member and you have to swim during the month of January. Well, I'm heading to Las Vegas again on Thursday so that left only yesterday to get my swim done...so it was do or die. I chose do! at 15 minutes: 900 yards...the furthest I've ever gone in 15 minutes based on monthly timed 15 minute events. Previous PR was 865 yards. at 1750 yards (1 mile is 1760 yards): 29:44...so totally on track for a 30 min. mile! at 2150 yards (1.2 miles is 2112 yards): 36:42...so on track for around a 36 min. half iron swim - add in the wetsuit and I'll be rockin'! Average pace for 100 yards therefore was 1:45 or less with at least a third of the hour holding a 1:40. The fastest 100 was 1:33. To see these numbers is AMAZING for me because I felt like I picked a pace at the beginning that I could hold for an hour and wasn't killing myself and likely wasn't above 75% of my HR. In a race situation, I think I could step it up to 80% without too much trouble and gain some extra distance. SO, to be at this level in January is HUGELY motivating for the season to come. Since the swim has certainly become my strength in triathlon thus far, I need to really focus on my bike and run...but I feel sure that with 2-3 days of pool time each week, I can maintain or improve my swim without too much trouble. COOL. "The sun is shining, the day is young, we've got our whole lives ahead of us and you're inside worrying about a stupid burned out bulb?" "Just one...and then I'll replace any wiring that's not up to code." "You know I can't reach that stupid bulb!!" "OH, me, me!!! Pleeeeeeeeze let me change the light bulb!! Can I?!! Can I??!! Huh? Huh? Huh? Can I?" "Let the Border Collie do it. You can feed my while he's busy." "I'll just pop that sucker in while I'm bouncing off the walls and the furniture!" "I'll just blow in the Border Collie's ear and he'll do it. By the time he finishes rewiring the house, my nails will be dry." "Why change it? I can still pee on the carpet in the dark." "Who cares? I can still play with my squeaky toy in the dark." "Can somebody else do it? I've go this hangover..."
"I see it –– there it is ––there it is, right there..."
"I can't chase it so who cares?" "Light bulb? I'm sorry but I don't see any light bulbs." "You mean I have to get off the couch?? OH all RIGHT!!! Harumph..."